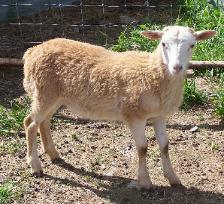 Desert Sand are hybrid sheep created in Texas, USA around 1900 with Mouflon Sheep influence in their ancestry. Desert Sand Sheep are a naturally shedding, and are generally light to dark shades of champagne, cinnamon or copper colored. All rams must have horns, and the ewes are allowed to have horns although most ewes are polled. According to the United Horned Hair Sheep Association, "The Corsican Group of Sheep (Painted Desert, Texas Dall, Black Hawaiian, American Blackbelly, Desert Sand, and sheep referred to as Corsicans) are actually the result of initial crosses decades ago between the shedding, European Mouflon Sheep (Ovis orientalis musimon, native to Corsica and Sardinia) with a wide range of more well known "wool" breeds of sheep including: Horned Rambouillet, Churro, Merino, and Jacob. At times, some of these crosses also included a hair or shedding sheep called the Barbados Blackbelly (Ovis aries) which were imported from the Caribbean island of Barbados, West Indies with bloodlines originally coming from Africa."